Saturday, March 29, 2014 ended up being one of those deceptively cold days in Chicago. Most of the day was sunny, but that cold slapped you eager smiling face as soon as you walked out the door and realized the sunshine was lying to you. Inside Goose Island Wrigleyville, it was quite toasty as the back bar was crowded with brewers, distributors, kegs, and beer drinkers for the annual Goose Island Stout Fest. Once I was approved for my age and identity I made my way into the massive stout drinking population to find Transient Artisan Ales. My first pour had to be Hank. I’ve been reading about it, and was excited to finally be in the presence of its awesomeness. A well-balance coffee porter, it was not to be missed. Chris offered two different versions of Hank using two different coffees; both were excellent and should be sought out. Next stop, Bourbon County Brand Stout Proprietor’s. The coconut was starting to fall a little compared to drinking it in November, but was still SO excellent. I probably had about 3 tastes of that over the course of the day. 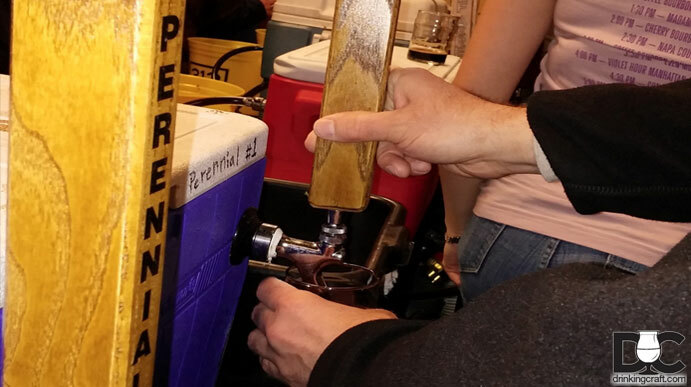 Four Hands Brewing was also there, bringing their Chocolate Milk Stout, Madagascar – a vanilla Russian imperial stout and Eclipse – a barrel aged imperial milk stout with raspberries. I can find their Chocolate Milk Stout in my neighborhood bottle store and it is excellent, so I was excited to try more of their offerings. Of what they brought, I think the Madagascar was my favorite. The vanilla was definitely there, but not overpowering and the base beer was rich chocolatey goodness. Eventually I made my way back to Perennial Artisan Ales, Half Acre and 18th Street Brewing. Perennial was my first stop. Although they were out of Abraxas by the time I got back there, which was actually a good thing because I tried their two other beers, which were also excellently crafted and very tasty. My first pour was a half and half of 17, an imperial stout with cacao nibs and mint leaves and Sump, an imperial stout blended with Sump coffee. WOW. I was so happy for the recommendation. I was not sure how I would feel about mint and coffee and Russian imperial stouts all together, but it was an amazing blend. I later tried each on their own and they stood up by themselves as well. At Half Acre I tried Baume and Chocolate Camaro. Baume is a hopped up chocolate rye stout, that actually tastes more like a rye IPA. It was very interesting, but very good. Chocolate Camaro is a chocolate milk stout, but it was a little drier and less chocolatey than I expected. Good beer geek conversations were had over the two with the brewer from Half Acre on their upcoming expansion. In recent months within the craft beer social media arena I have seen a lot regarding 18th Street Brewing, but up until Stout Fest had not been able to try anything from them. On a recommendation I tried the Barrel Aged Hunter Coffee. It was phenomenal. Regular Hunter is a creamy double milk stout brewed with cocoa nibs and lactose. The coffee version used Metropolis Coffee Company’s Redline Espresso. Put the two together and you have magic. 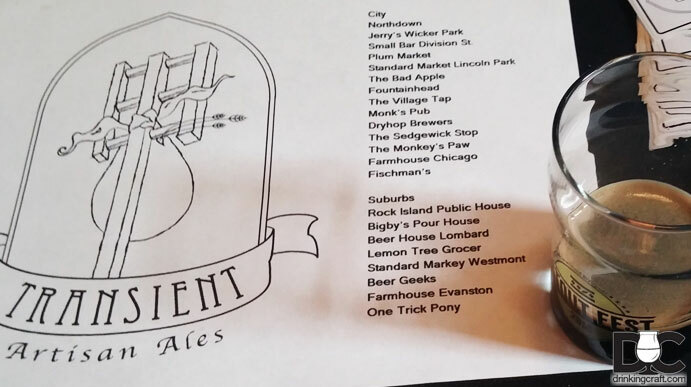 I am really excited that in addition to Flossmoor Brewing, One Trick Pony, Transient Artisan Ales, and Three Floyds, I have another great beer destination to stop at when I am in the area. 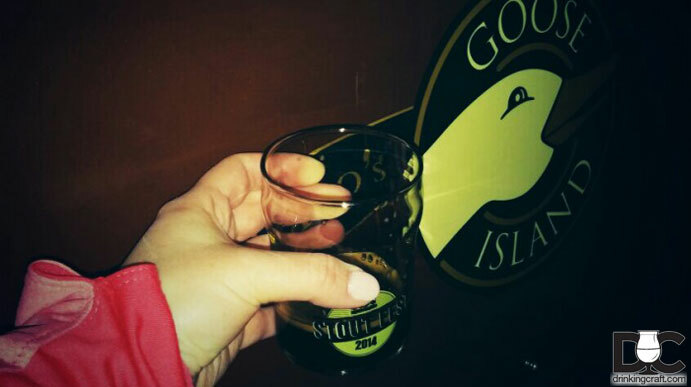 Last but certainly not least, Goose Island brought the big guns. Goose Island Clybourn brought Nthulu, a American barrel aged stout with Hazelnuts and Vanilla, Morticia, a red wine and bourbon barrel aged rye stout blend, Ego Suicide, a Baltic porter with maple syrup, coffee, and vanilla beans randall’ed with orange peel and cacao nibs, and Meridian Candle, a heavily hopped and dry hopped American stout. 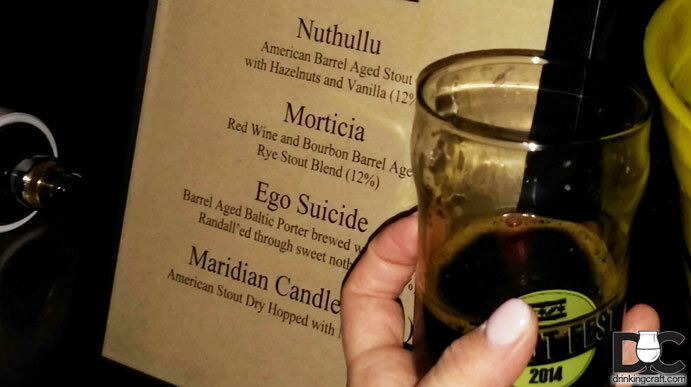 Of those, my favorites were Nthulu, which tasted like liquid Nutella, and Ego Suicide, which tasted like those milk chocolate oranges that come out around Christmas time. You know…the ones you smash to break into “orange” slices? I mean, it tasted EXACTLY like eating one of those and brought back a lot of happy Christmas memories. Nthulu ended up winning the cup, which was…a fermenter. Yeah….a fermenter with a lid…so a fermenter stein? Which I promptly requested a drink of Nthulu out of. I’ve never drank from the Stanley Cup, but I think it’s as close as I’m going to get to completing that line item on my bucket list. We’ve got Beers, Say Cheers!